Like the guide says, be careful not to over tighten the nuts and bolts. This was my worst mistake, I over tightened and changed the shape of some of the wood pieces on accident. I bent my motor mount and had to put 2 washers under the motor to make it sit straight to make my m5 rod parallel with the aluminum extrusion. The bearings with the eccentric bushings might seems like they don't fit, but keep trying without forcing them and they will fit. Spin the eccentric bushings so that the smallest side is facing the extrusion, then spin them again after installing to tighten the carriage. I have some questions as I get closer to the end. Do I need to flash my arduino with firmware? Or is the firmware already on there? Any advice on extending the build platform? My 1inch platform has a little nub in the center of it, I was going to slice off the nub, then glue a 2" or 3" aluminum disk to it. What setting should I use or try in the Creation Workshop software to configure my machine? Welcome to the forum! Looks like a nice build so far. *edit* Never mind, you're building a different machine than I thought you were. I'm not sure if there's a manual thread for the DropLit or not. I think the Arduino is unflashed as it is. Gene is/was working on Droplit manual, don't exactly know whats going on with that. If you need a good reference, check out Mhacney's droplit build in the build zone sub forum. The only changes I can remember were the arduino hole locations, and the 4 cheapskate bearing holders that don't come apart. Apparently, according to comments on the last page there are some problems with the droplit firmware. I've never been able to get the firmware for mine to work - I can interrogate it and it replies, but the first G code causes it to become unresponsive. I haven't had the time to chase it down. How did you get to that point? I just finished building the machine, now I can't make it move. I have Creation Workshop and tried to use their controls to move the stepper, but its not moving or registering. I got it to move by controlling it with Creation Workshop. At first the motor was super loud and chunky sounding so I adjusted the trim pot. It still doesn't turn smoothly, but its not as loud. Trying to figure out why its no turning smoothly. I posted my firmware for the grbl and config in my droplit build thread. You should be able to upload it and as long as you connect things the same as mine, it will work. mhackney wrote: I posted my firmware for the grbl and config in my droplit build thread. You should be able to upload it and as long as you connect things the same as mine, it will work. Thank mhackney, I actually got the machine to do a dry run. It looks like fine, but maybe the distance its traveling is still too much. I'll check out your thread. mhackney, I removed the jumper that was making the z move the wrong distance. I think its moving the right distance now, thanks. I tried to flash the board with the grbl.hex.txt file you uploaded. I changed it to a hex file instead of a txt file, it would upload, but the machine wouldn't move, so I went back to the hex file in the Droplit_master on github and it started working again. Did you get the hex file out of the zip package I posted in my DropLit build thread several days ago? As for that anti-backlash nut, I noticed this too. In practice, backlash is not a problem since the build surface is always pushed into the vat to flash a new layer. The withdrawal simply needs to break the hardened resin free from the vat surface. However, you can either wrap a rubber band or even a small zip tie around the two upright arms of the anti-backlash print to squeeze the in against the top nut. mhackney wrote: Did you get the hex file out of the zip package I posted in my DropLit build thread several days ago? Haha, thanks! the hex file I got was from August. I just downloaded the new zip. I'll try the rubber band advice. When I saw my z-carriage twist a little bit my first thought was that it could almost be like a passive separation mechanism like a passive tilt, so maybe it could be a good thing. I'll have a working Droplit if I can reverse the direction of the stepper motor, it goes the wrong way. Could I just switch the order of the wires? Yes you could just change the wire order, that works fine. mhackney wrote: Yes you could just change the wire order, that works fine. Thanks I'll try today, and probably try my first print tonight! Thanks again, the motor is going in the right direction now! I'm doing some dry tests by focusing on a piece of paper and running the print, but it seems like the the Droplit and my projector aren't in synch. Like the projector flashes a photo at the wrong time, or the z-axis isn't in the right spot when the projector flashes. I tried to print a cylinder and I got about 5 layer printed, then nothing was building on to the print after that. 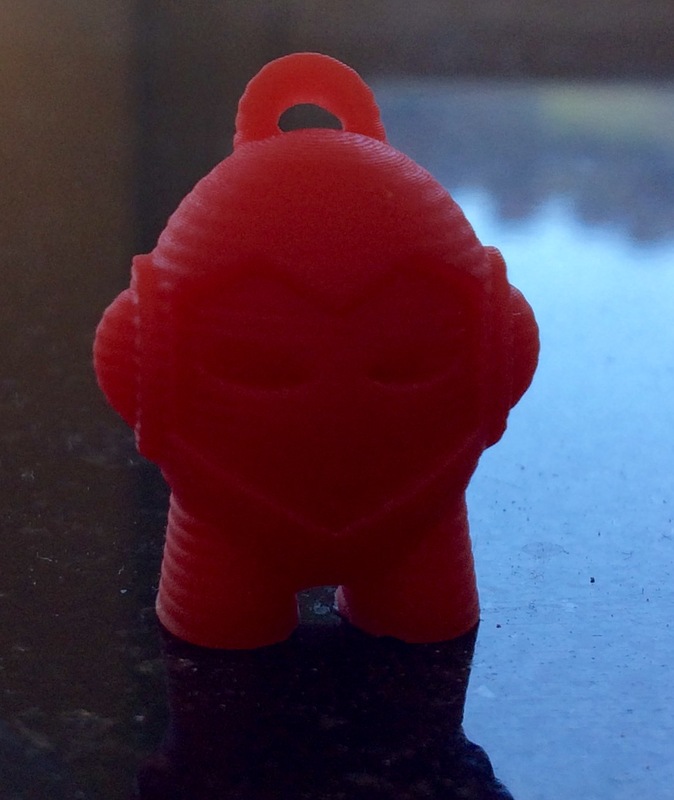 Then I tried to print a marvin and only the first layer of the feet printed. After I stopped the print and looked at the build plate, it looked as if the first layer had slipped across the build platform. The cylinder had also moved a little. It seems like I'm having trouble getting the prints to stick to the dumbell. Is this a common problem? I didn't have any problems sticking. Make sure to set Z=0 so the dumbbell is touching your build surface. Also make sure it is clean. Your video timing does look a bit odd. Can you post your slicer configuration for us to look at? mhackney wrote: I didn't have any problems sticking. Make sure to set Z=0 so the dumbbell is touching your build surface. Also make sure it is clean. Your video timing does look a bit odd. Can you post your slicer configuration for us to look at? I just completed my first print. Looks like i've still got a long way to go! Any suggestions on how to fix these artifacts? Or at least pinpointing the problem, I think it is either z-wobble or undercuring. Thanks! 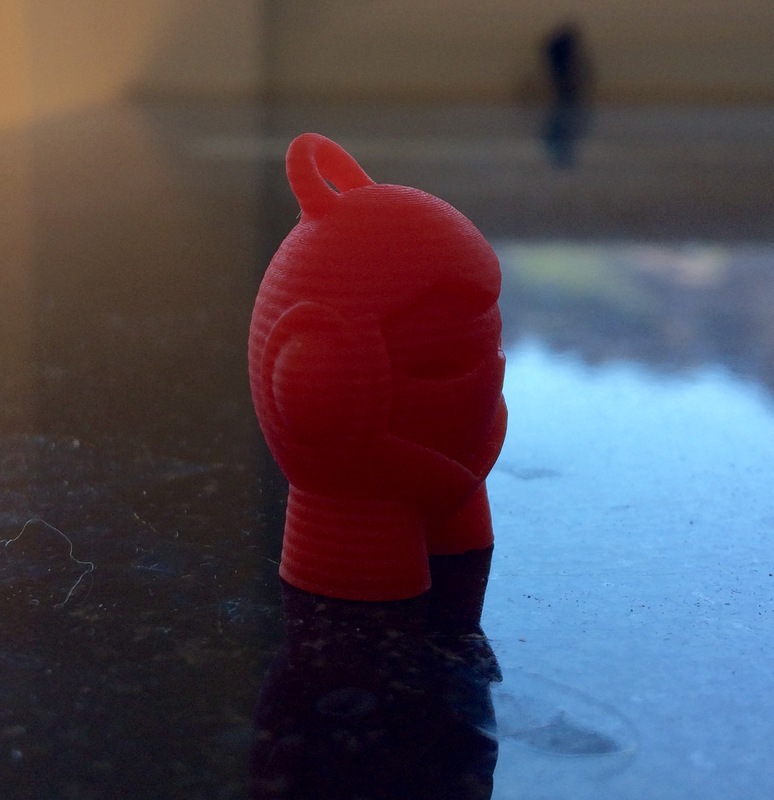 That is some sort of Z axis artifact so concentrate on watching and feeling the Z axis move without printing. Something this big should be "painfully obvious".